Studio Artifacts is an interview series, which invites artists to select, examine, and discuss some of the significant items they keep in their workspace and gives readers an intimate glimpse into their practice. 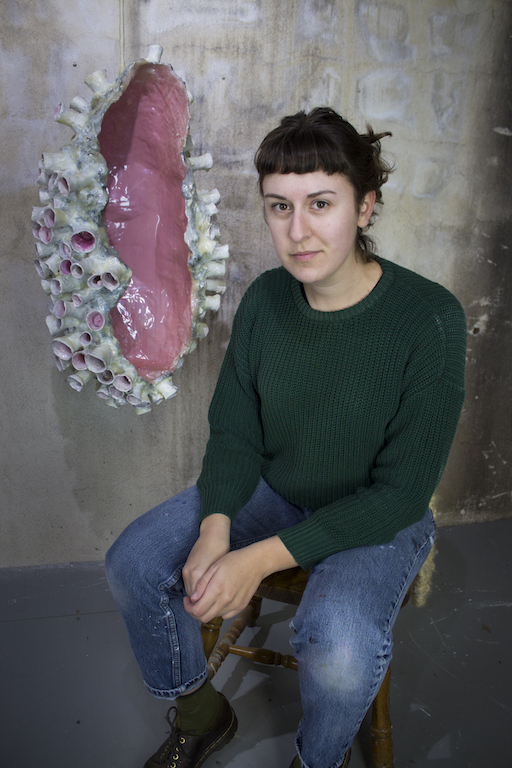 Alyssa Lempesis is an Oakland-based artist who uses strange and innovative materials to create mysterious sculptures and animations inspired by our internal and external ecosystems. TUBE. : Can you tell me about your collection of conch shells? 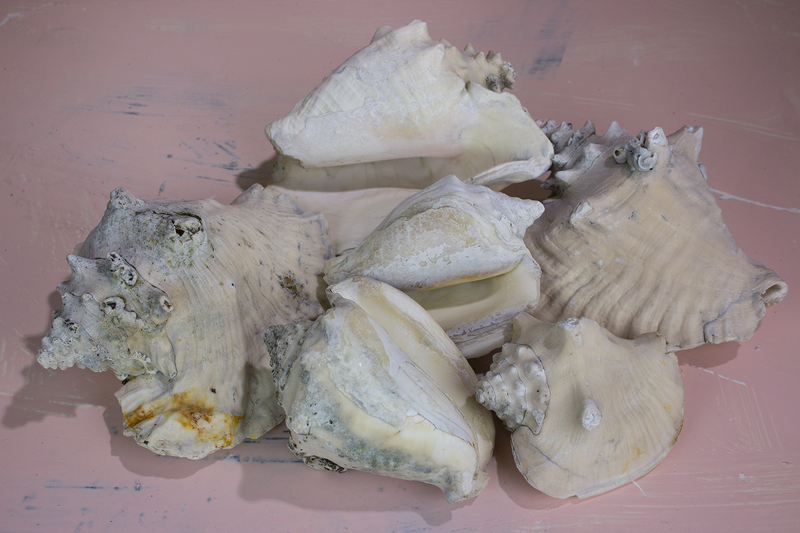 Alyssa Lempesis: There has been a collection of huge conch shells in the front yard of my parent’s house for as long as I can remember. They’re huge, like the size of my head! When my mom was growing up she would dredge Miami Beach for shells. I’ve been making a lot of work based on underwater imagery so to have these primary source materials at my fingertips is really exciting. I love being able to touch, examine, and photograph them. Cleaning them was also this really weird experience. They were filthy since they’ve been sitting in the yard for like twenty years. They were filled with mold and snails were living inside. So when I was cleaning them all of these snails were falling out of the shells into the sink. It was kind of horrifying but also a really interesting, tactile experience. There were these slimy snails living in these slimy shells and it all smelled like earth. It was gross and it was also kind of cool. T: So these shells were in the front yard of your childhood house? Do you remember looking at them a lot and appreciating them when you were younger or was it more recent? AL: It has been a more recent thing. My mom buries a lot of stuff in our front yard. Our front yard has always been a collection of strange things buried in the ground like sculptures, ceramic heads, and shells. T: Is your mom an artist as well? AL: Not really. But she’s artistic. In the past five years, she has started quilting. And it’s been really cool because we suddenly have all of these things to talk about! She understands my art practice in a completely different way now that she has found an art practice of her own. We have long conversations about color and texture and pattern, especially. I’ll look at her quilts with her and she’ll give me feedback on my sculptures, which is kind of awesome. T: What do you think is the most interesting aspect about the conch shells? AL: I’m really interested in the inside/outside tension of the shells. The inside is so smooth and the outside has this ripple. It’s like a frill along the edge, which is very elegant. Some of them have additional barnacle growths. I think they are so mysterious. T: Do you want to talk about the replicas of your hands? AL: The hands are funny. I can’t get rid of them because they are made from a material called Ultraflex that reconstitutes. I have all these hand replicas because at some point I will melt them down and make something else. T: When did you make your first hand replica? AL: Creating one of the hands for the first time was a pivotal moment for me as a student because I was working on this piece and I couldn’t figure out what to do. I was doing all these experiments in the studio, which is like a sea of bits and pieces and odd things. Sometimes when I can’t decide what to do I’ll just make a quick mold of something and cast it. I made the mold quickly in a coffee cup. I put my hand in the cup, walked around the studio for a while, pulled it out, poured the mold, waited for it to cool, and then I pulled out this replica of my hand. Ultraflex was a new material for me. It’s super jiggly and is often used for special effects. It’s also used as a coating for dildos. It’s like what you would imagine intestines to feel like. It’s like spongy, wet, Vaseline covered blubber. Holding my hand in my hand was very exciting. I put the hand replica on a sculpture and I loved seeing my hand touch the sculpture the way I would touch it. I was able to have this meta-experience where I could watch my hand caressing my sculpture from afar. Sometimes I like to just hold them. I like the experience of holding my hands. T: Can you discuss the books you’ve chosen? AL: I found this book, This Living Reef when I was doing a residency at Alter Space in San Francisco. I was working underground and I was super interested in subterranean spaces. So I was looking at all of these pictures of abandoned mines and all of these really strange bacteria that poop out metals. Around the same time, I went to the aquarium and it revitalized my interest in all of these underwater things. When I found This Living Reef, I was starting to shoot an animation with all of these pastel colors. It was fairly muted and very similar to sculpture I had been making. This book inspired me to go beyond my comfort zone with color. I introduced colored lights and made my sets much more vibrant. 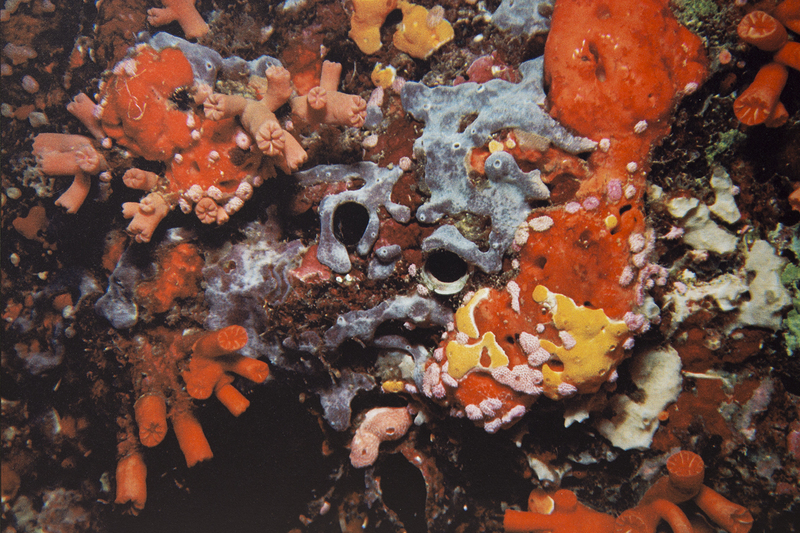 The book has all of these pictures of coral, anemones, strange plants, and fish. There are all of these crazy textures and colors. It was so totally inspiring and it continues to be a source of inspiration for me. T: Can you describe your process from looking at the images in This Living Reef to the creation of a sculpture or animation? AL: This book is always open in my studio. And I don’t think I’ve ever had a book like that. This is the first time as an artist that I’ve come across something that has been a continuous source of inspiration. I can open to any page and find something interesting to explore! T: Can you discuss the other book you’ve been looking at a lot lately, Hidden Beauty? AL: I found Hidden Beauty a couple of months ago. I was walking in my neighborhood under a BART overpass and someone had thrown it into the bushes with a bunch of other books. There’s a face-like image on the back of the book with all of this hairy texture. I thought, “What is that?” So I walked over and it turned out to be the perfect book for me because it’s full of photographs of bugs and plants taken with a macro lens. So it’s like making the invisible visible. The textures [in the photographs] are insane. I don’t even mind what they are. They’re just so beautiful as images and the textures are so beautiful. 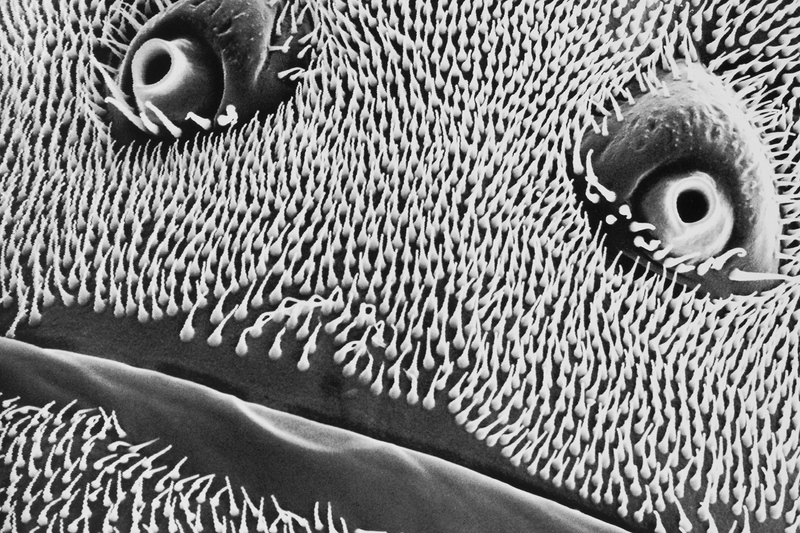 The image of the face on the back of the book is actually a respiratory pore of a gnat’s abdomen. T: Are you using this book in a similar way that you’re using This Living Reef? AL: Yes. I have not even cracked the surface of how to use some of the stuff I’ve discovered in this book. I like this idea of seeing something that no one can see and incorporating it into my work. A lot of my work is about the things we can’t see and abstracting them. Things we can’t see but we can feel. For more information about Alyssa and to check out some of her beautifully strange and tactile sculptures and animations, visit alyssalempesis.com. 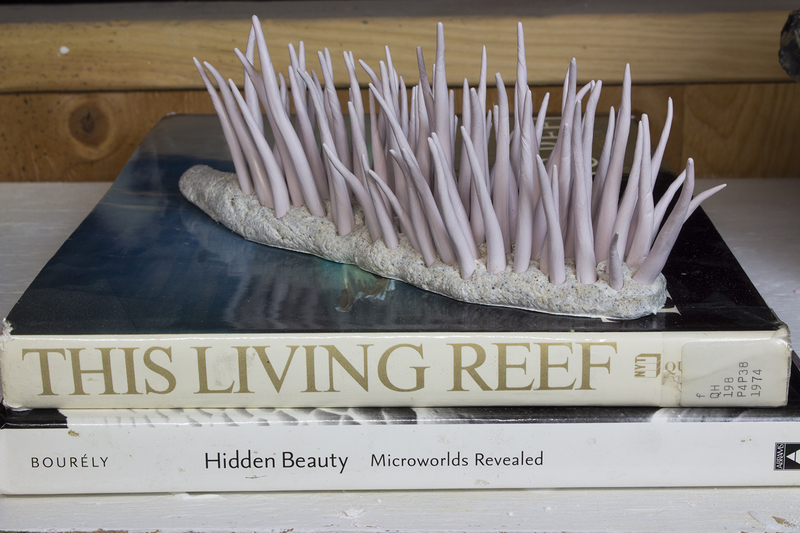 Tags: Alter Space, Alyssa Lempesis, Art, Artist, books, conch shells, Douglas Faulkner, France Bourely, hands, Hidden Beauty, Justina Martino, Miami Beach, Oakland, quilts, San Francisco, sculpture, Studio Artifacts, studio visit, This Living Reef, TUBE. Magazine, Ultraflex. Bookmark the permalink. Previous post ← What I’m Listening To: Jennifer Jackson.